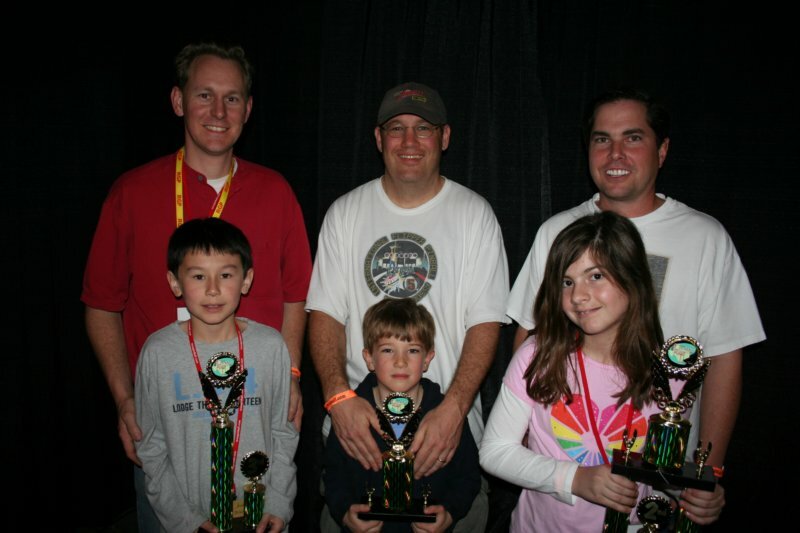 Date: March 13th - 15th, 2009. 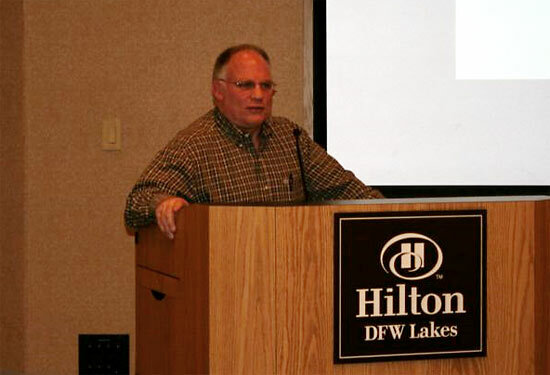 Location: DFW Lakes Conference Center, Grapevine, Dallas, TX 76051, USA. 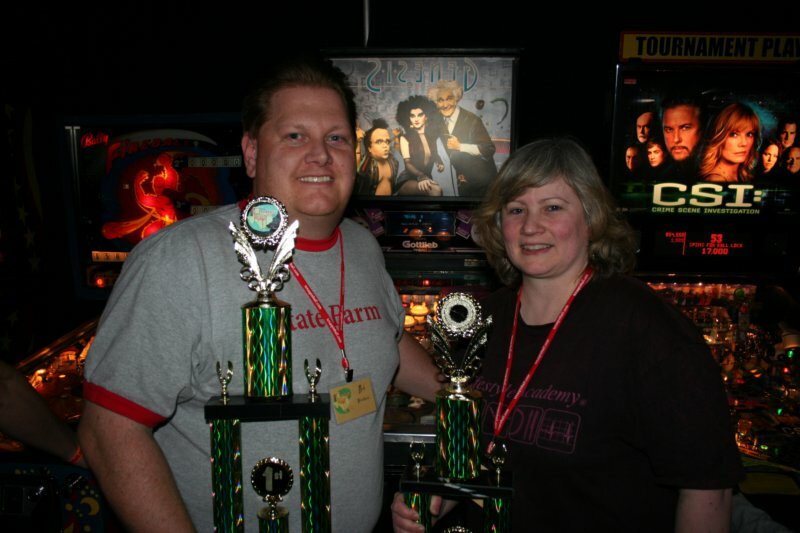 Report by Kim Keist (www.KimballsPinballs.com) of Lakeside, Texas. 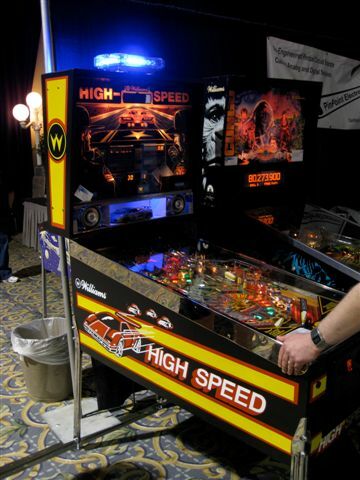 This year the Texas Pinball Festival was held over the weekend of March 13th -15th 2009. 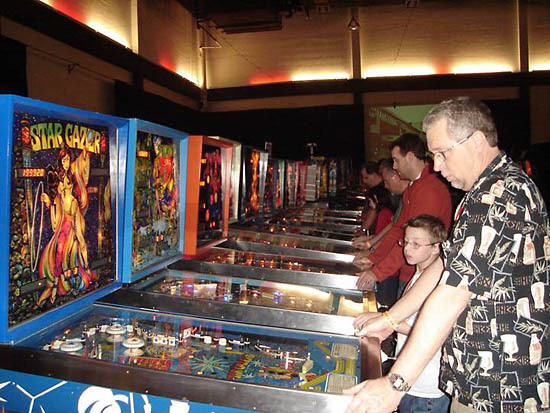 This was the third event at the new and much larger location and this year it was definitely needed with the number of pins topping last year's total at more than 200. 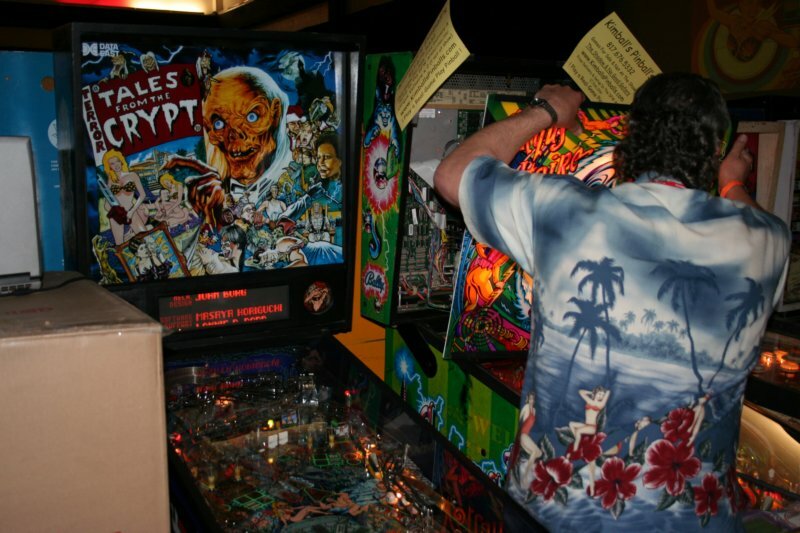 It was hard to keep track of the total number of pinballs as Gilbert aka “Wolfman” kept bringing more and more pins into his “Pinball Triage” area for repair where he had half-a-dozen pinball technicians hard at work getting the games ready to play and to sell. 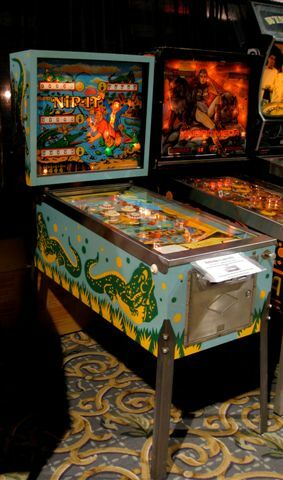 Rainy weather was forecast for Friday, so a larger number of pinball enthusiasts (myself included) and some vendors were in evidence on Thursday evening to set up. 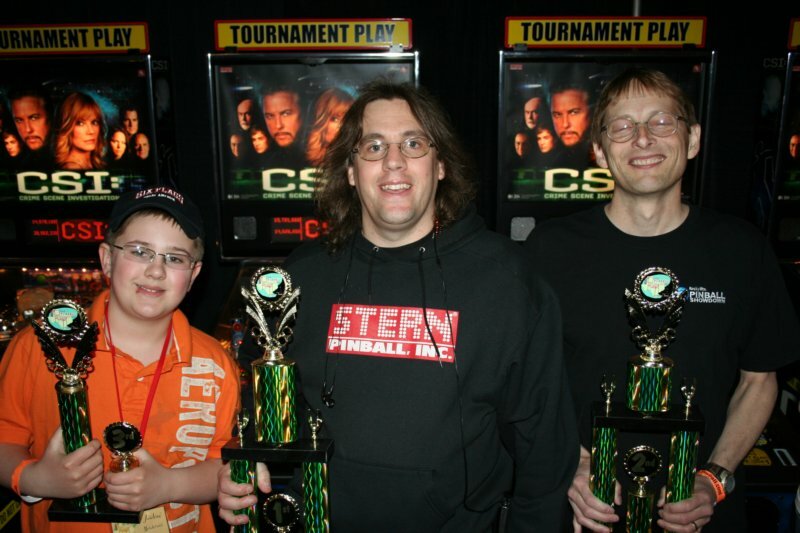 Brett Davis of Pin Score and Marc Mandeltort from Marco Specialties were out on the floor socializing with the locals and Marc was nice enough that he ended up helping one of them get his Tales From The Crypt up and running (which arrived DOA as pins tend to do whenever they feel like it. 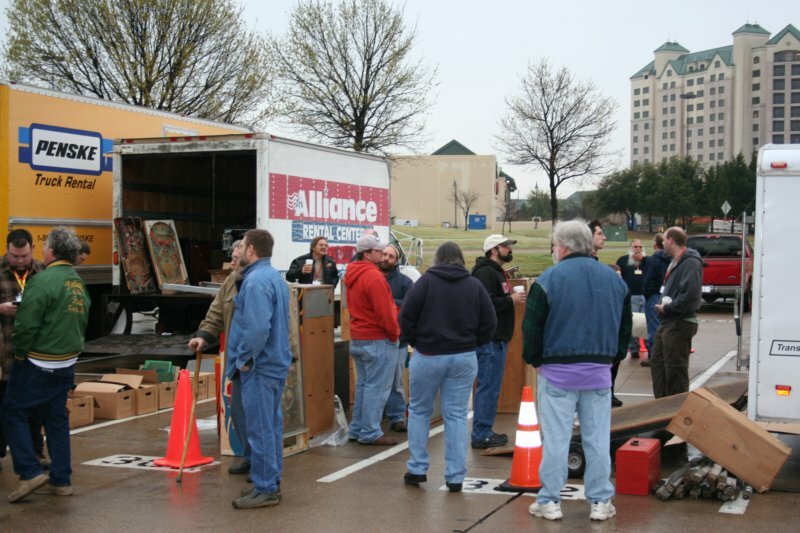 The problem turned out to be a bad 120VAC plug) with the remainder of vendors and enthusiasts setting up on Friday in the rain. 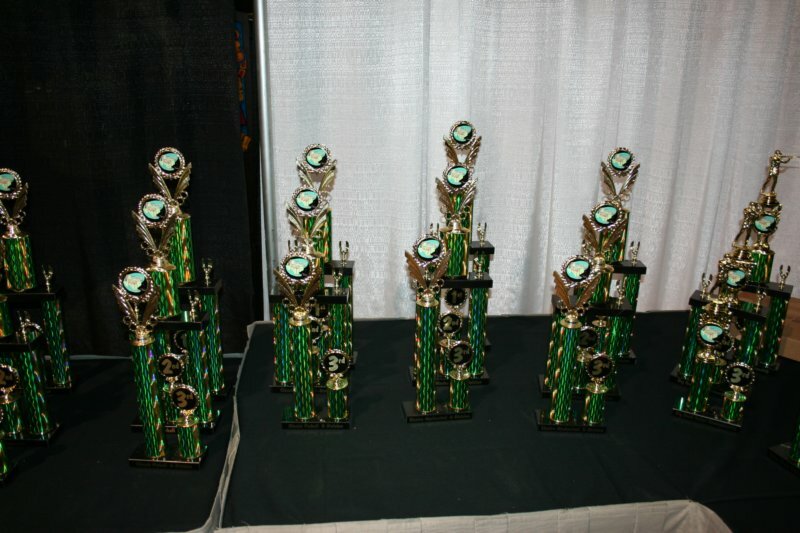 The fun began on Friday at 5:00pm. 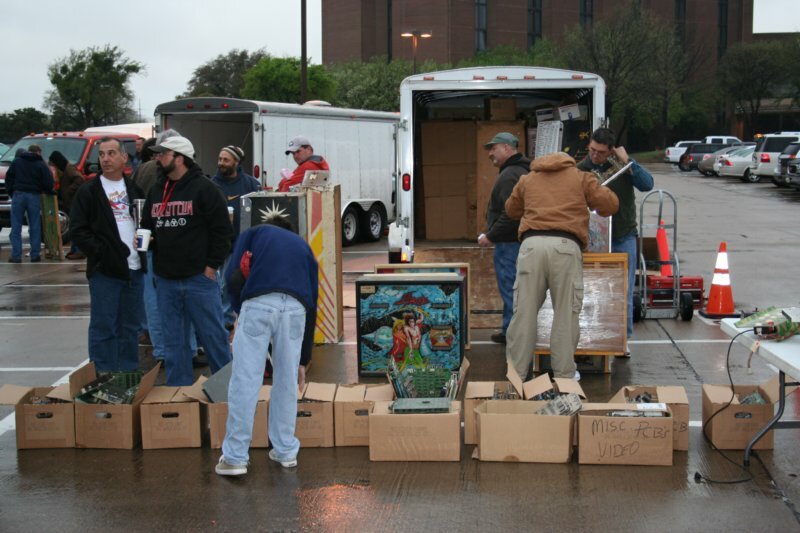 This year’s Saturday morning Swap Meet turned out to be the biggest one yet in the history of the Texas Pinball Festival with tons of great deals to be had and close to 100 pieces/pinballs for sale. 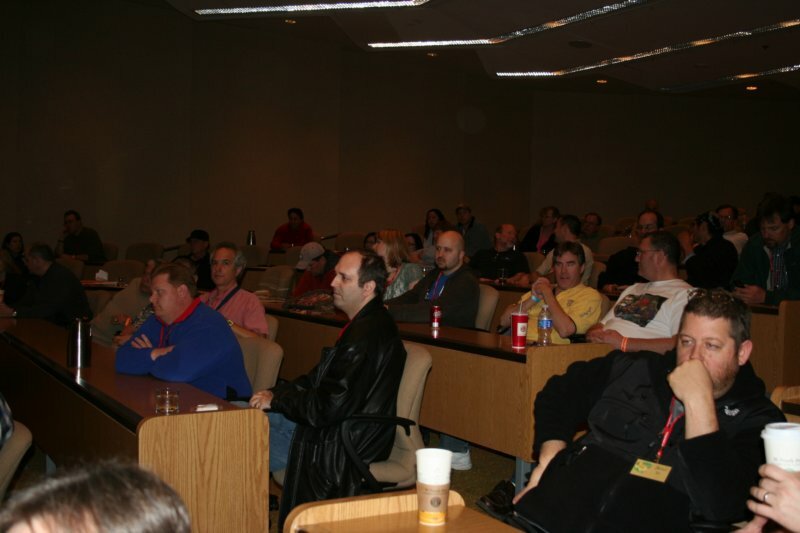 Saturdays seminars began at 11:00am CST. An absolutely fantastic seminar. 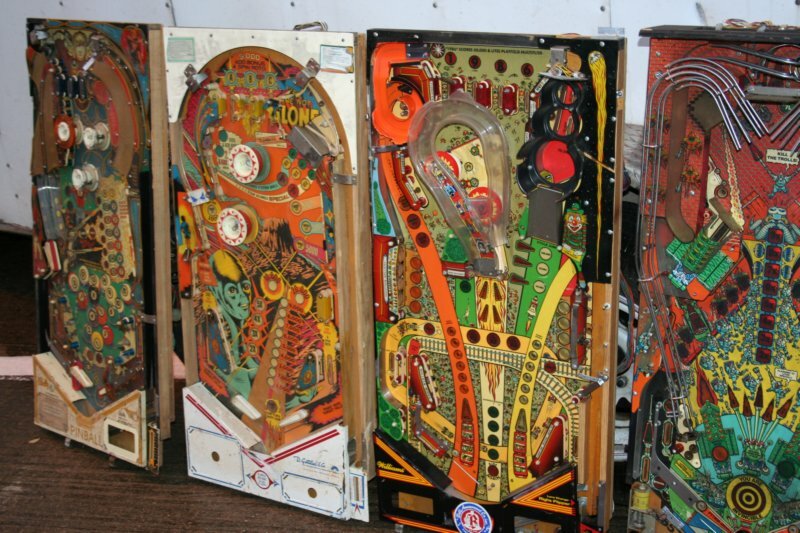 I never fail to be amazed at the ingenuity, versatility and pure talent of our pinball artists and how lucky we were for them to have chosen pinball as their method of artistic expression. 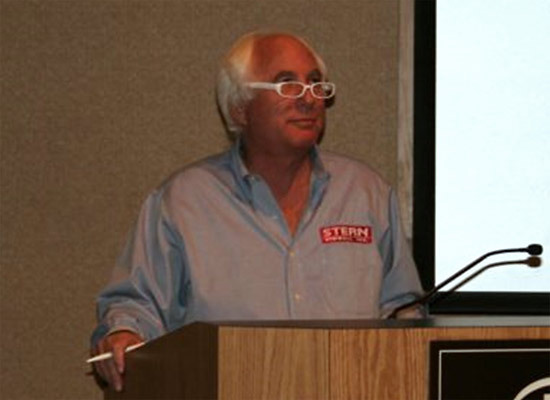 A highly informative seminar where Gary went into great depth on the business reasons (interpret that as for commercial purposes versus collector/recreational reasons) for some of Stern’s marketing methods and decisions. 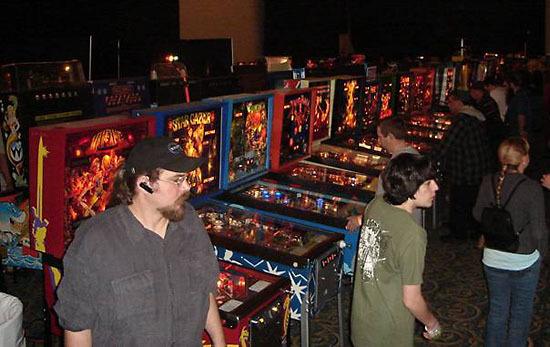 During his seminar he brushed aside some of the more off topic and rhetorical questions but he took great care and concern in discussing some of the more delicate situations surrounding pinball. 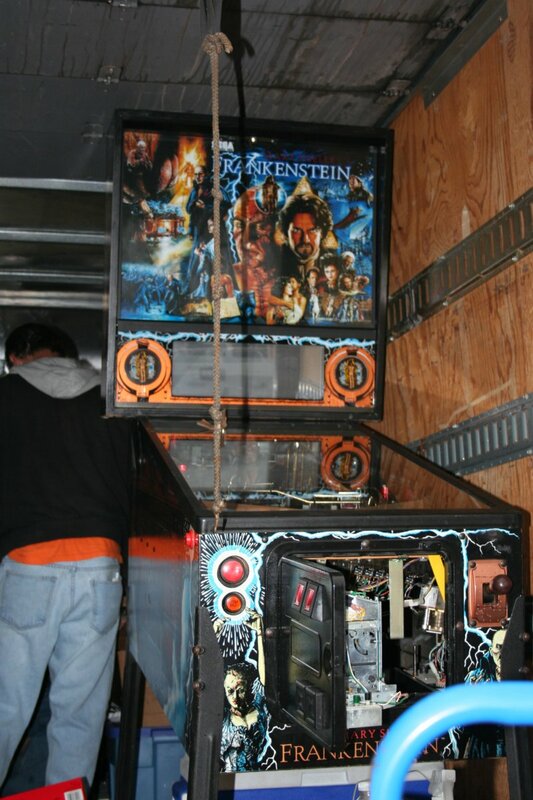 He specifically addressed the licensing issues that greatly affect Stern’s ability to do software updates in a timely manner as every little change has to be approved by the license holder/studio, and the hopeful continuation of pinball in general. 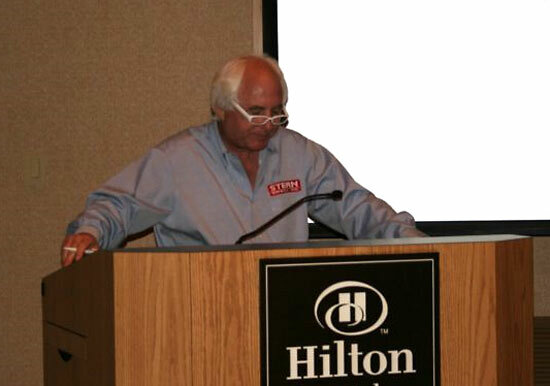 Gary also took great care to clarify some of the suggestions made from the audience, while actually pausing during his seminar to jot down notes on some of the ideas he deemed actionable. 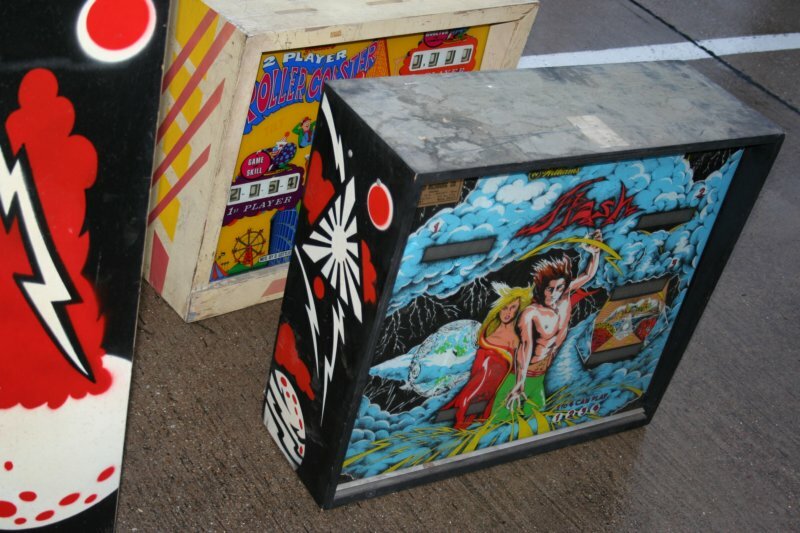 An awesome and informative seminar on the care and feeding of your classic Stern solid state pinball games. 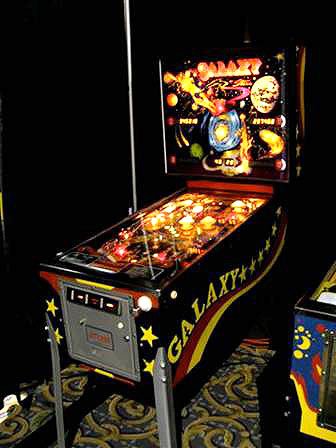 Bill went in-depth on drop-target and flipper set-up and other Stern specific mods. 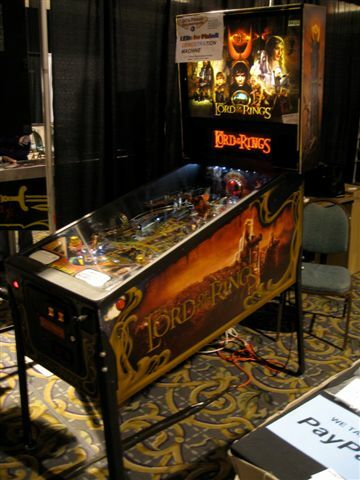 A great seminar on John’s progress on his direct ink to playfield project. 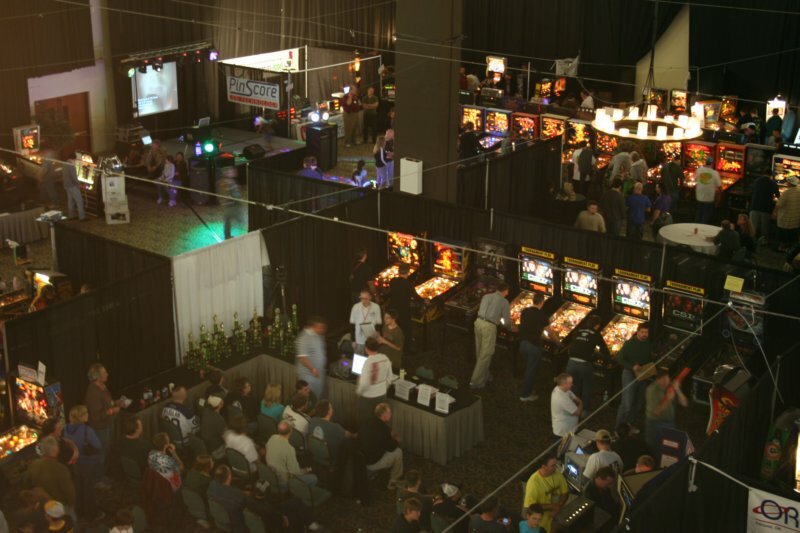 I was lucky enough to see John’s seminar at Pinball Expo 2007 and he seems to be making great strides in the advancement of his process and greater success in the registration issues he has had in the past. 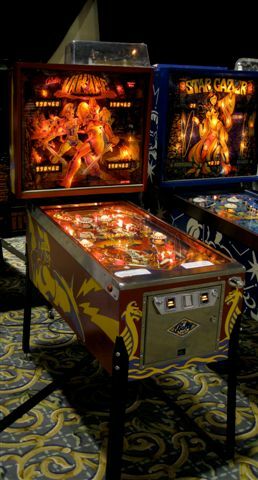 An informative seminar by Brett on how and why PinScore came to be and the engineering and design challenges he faced along the way which addressed the obsolesce of many of our common solid state components we restorer’s rely on to rescue and resuscitate our favorite older games. 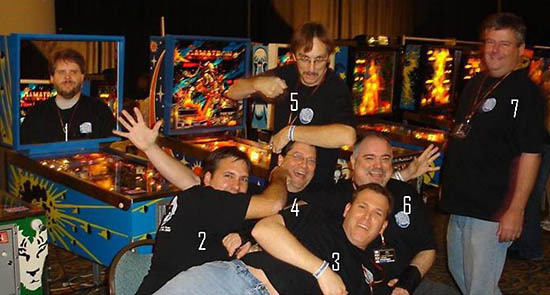 Brett also had some very interesting trivia questions with the winners getting a free 2009 Mr. Pinball Price Guide. 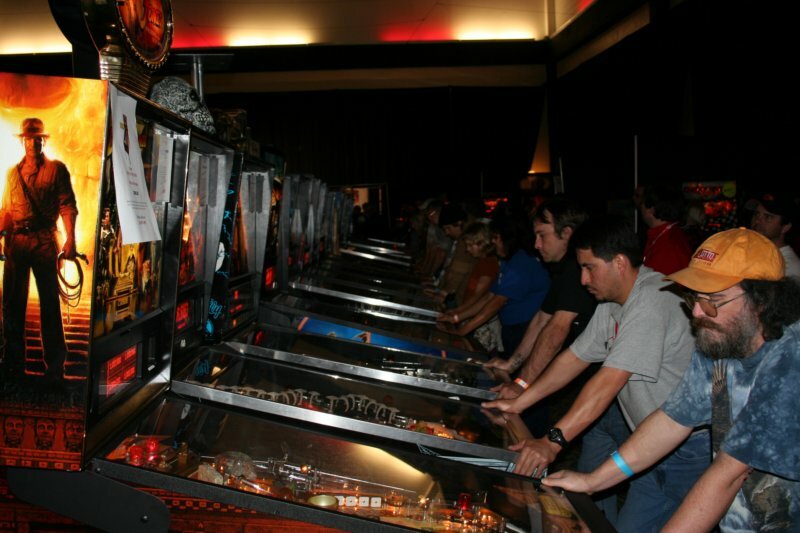 On Sunday, a number of awards were given for exceptional pinball machines in several categories. 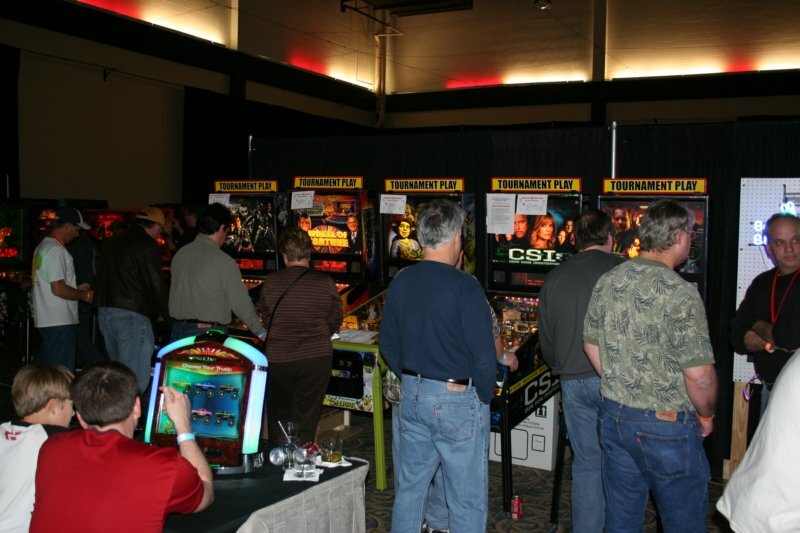 For a second consecutive year the Stern row was populated by games from a local following of Stern-loving enthusiasts and restorers (in no particular order): Rich Wiski, Scott Martin, Bob Myers, Erron Porter and Bill Morrison. 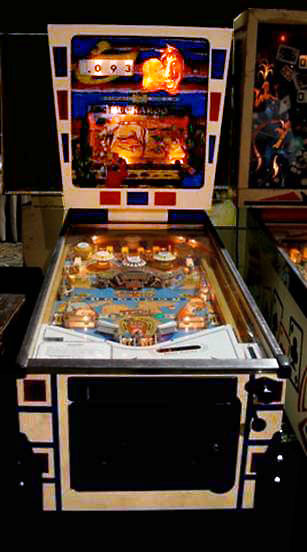 Bill also put on the superb and highly informative seminar entitled Classic Stern Pinball (1977- 1982) as well. 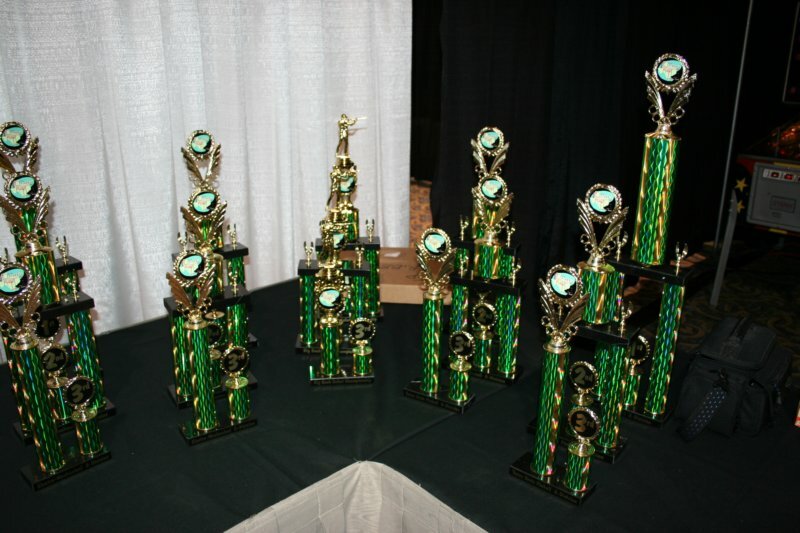 This year the Stern row consisted of: Stargazer, Seawitch, Split Second, Big Game, Meteor, Nine Ball, Lightning and Magic. 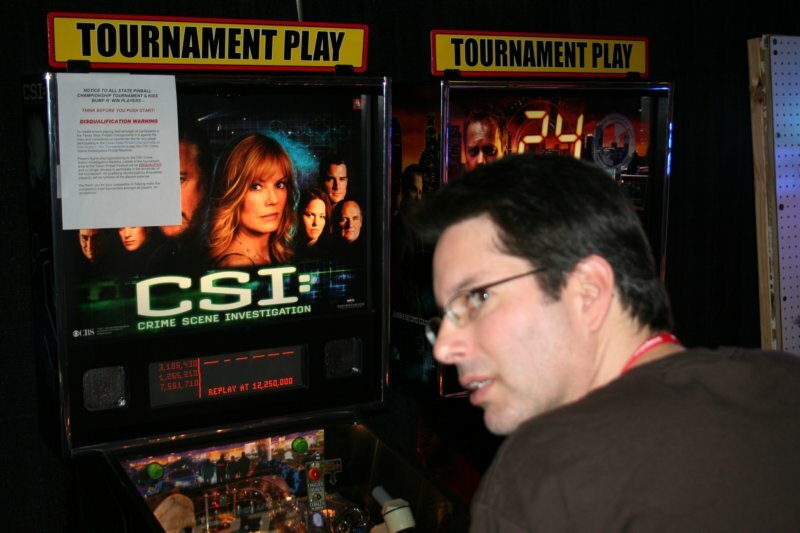 One TPF attendee was heard to remark "You should have seen the look on Gary Stern's face when he went down the Stern row. 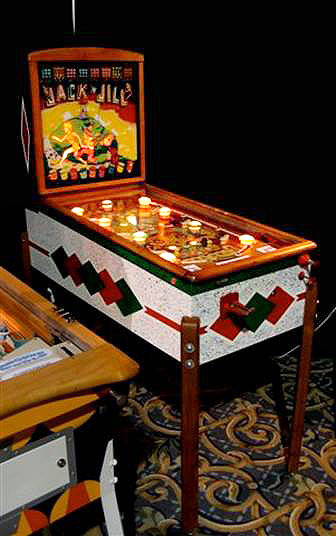 He seemed so impressed and taken aback with the love that had been bestowed on those old Stern games and their condition"
On Saturday evening, a hour-long area-wide power outage left the main hall in almost total darkness but provided a break for attendees to grab some dinner. 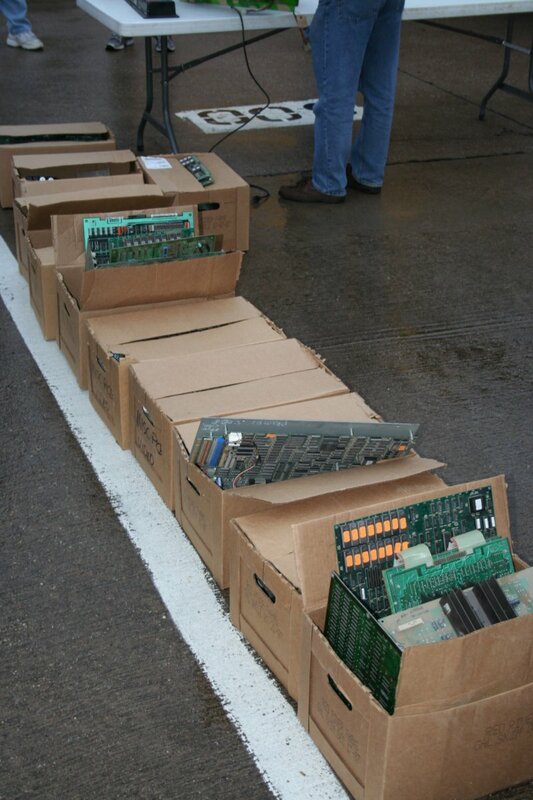 Shannon Smith (one of the TPF promoters) was there and observed "During the blackout we had a streaker! Seriously we had a dude come down during the blackout in a towel, wrapped around him! I can't believe no one took a picture! He said he had swim trunks on, I don't think anyone challenged him on that!" 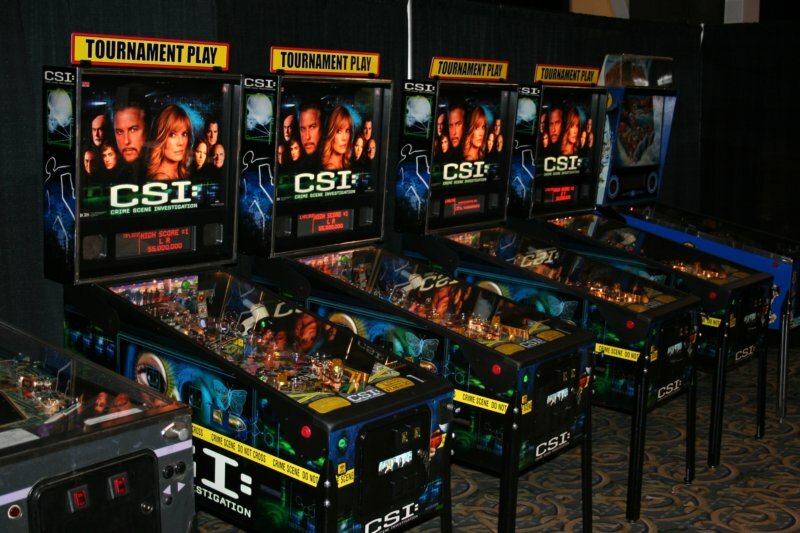 As soon as power returned, the tournaments and the rest of the show could continue into the night. 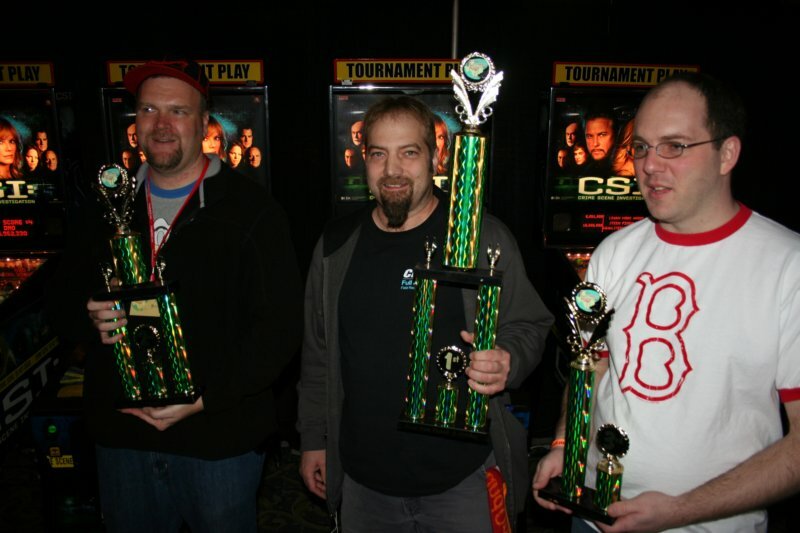 Ken Kemp, one of the organizers who heads up the tournaments at the TPF was pleased with the way the competitions went. 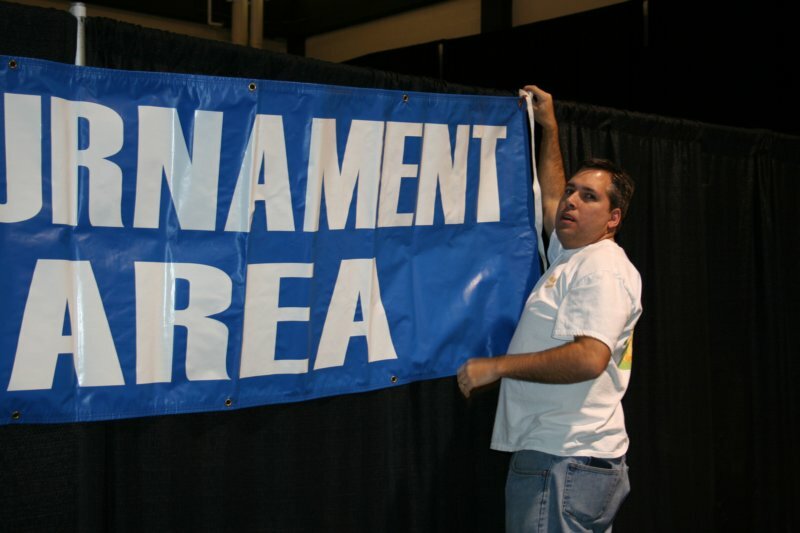 He said, "The tournament area was packed this year. I think this festival is quickly getting known as the show to make every year. 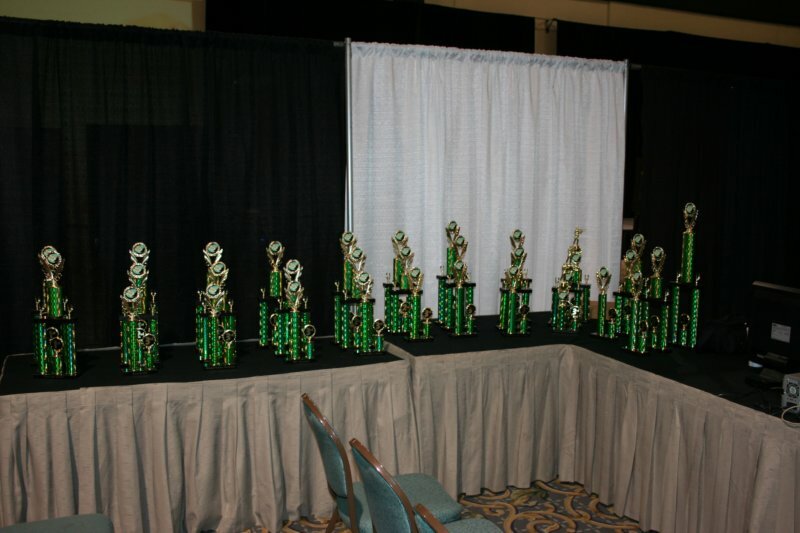 The word is spreading and the quality of players who show up proves that. 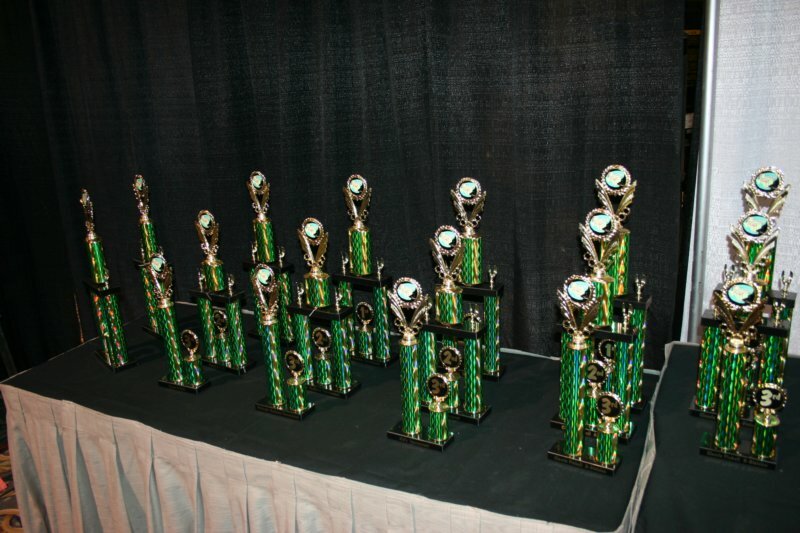 I am very thankful to everyone who helped out in the tournament area this year which made for such a great success." 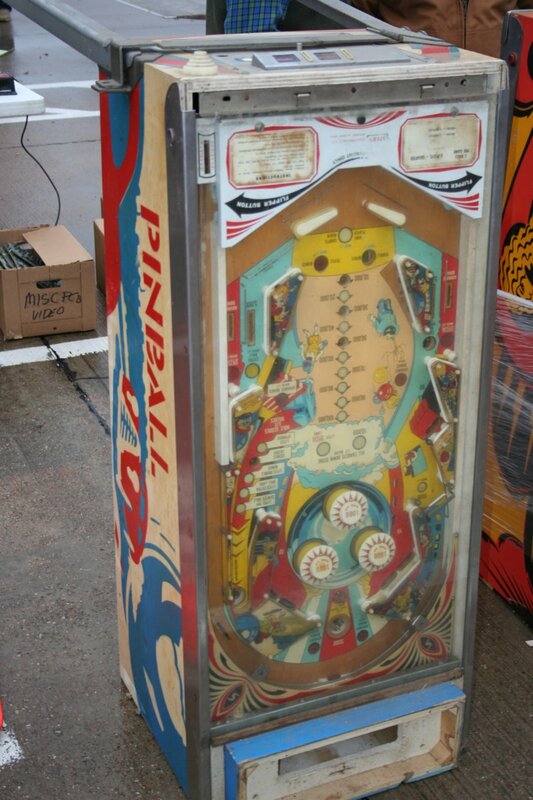 Each year, the prize draw gives one lucky visitor the chance to go home with a pinball machine. 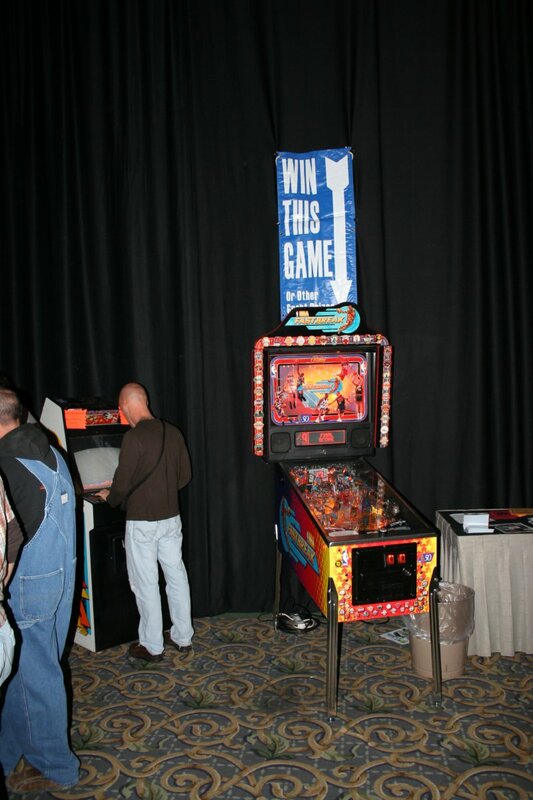 The main prize this year was a Bally NBA Fastbreak pinball machine. Tickets cost $4 each of 6 for $20. 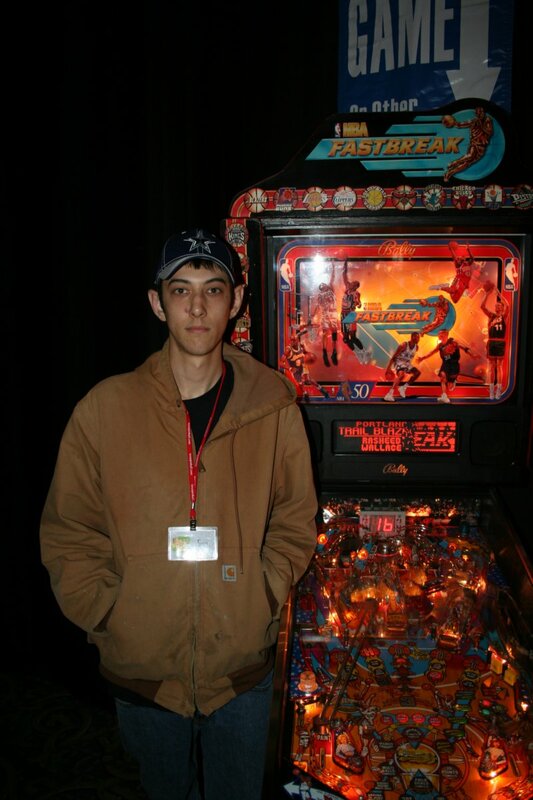 The lucky winner of the NBA Fastbreak was Sean Auger. 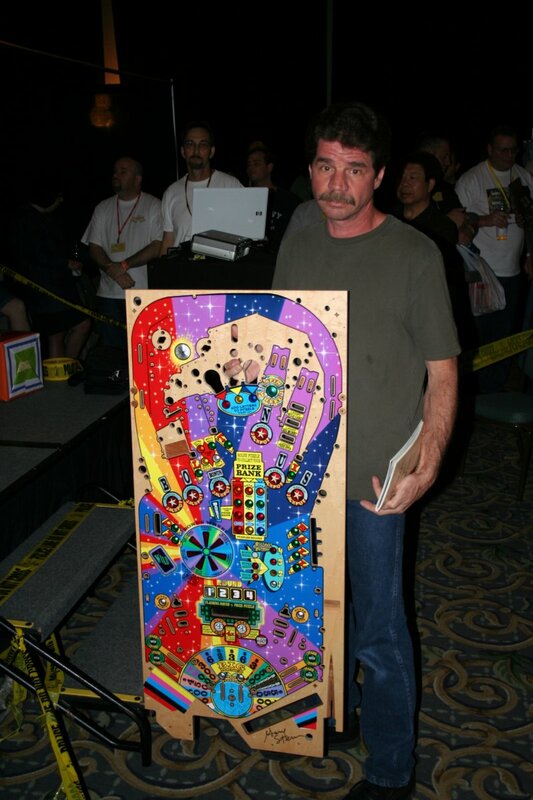 In addition, a Stern Wheel Of Fortune playfield signed by Gary Stern was won by Scott Hudy. 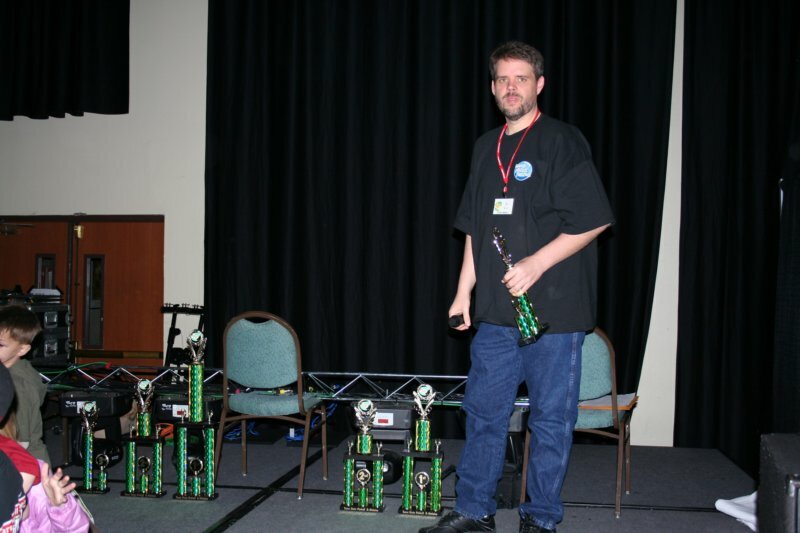 Then it was time for the tournament presentations. 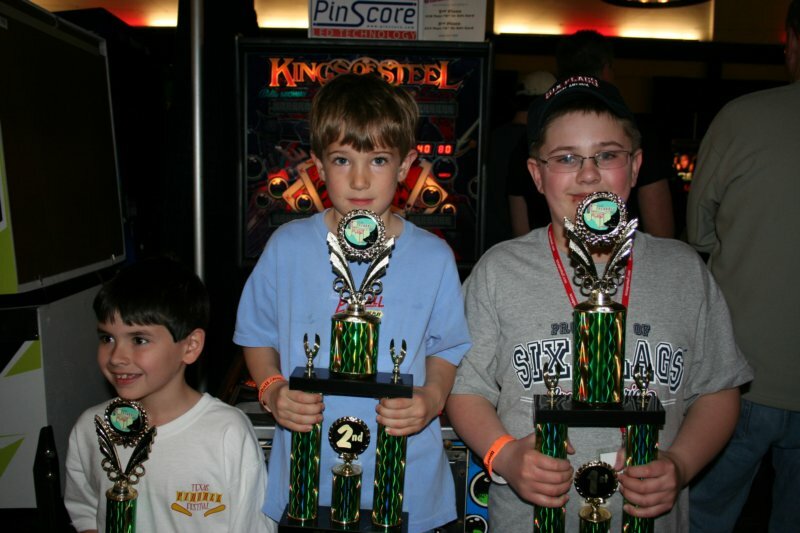 1st Places wins Kings of Steel Pinball Machine! 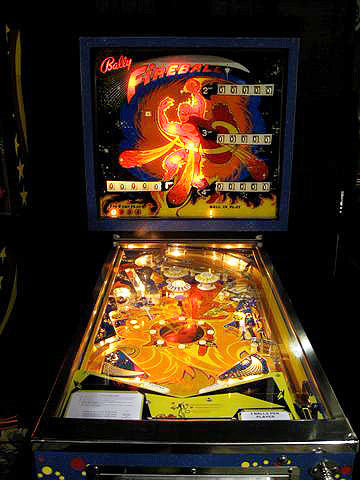 We’ve even got some top sports personalities getting into pinball. 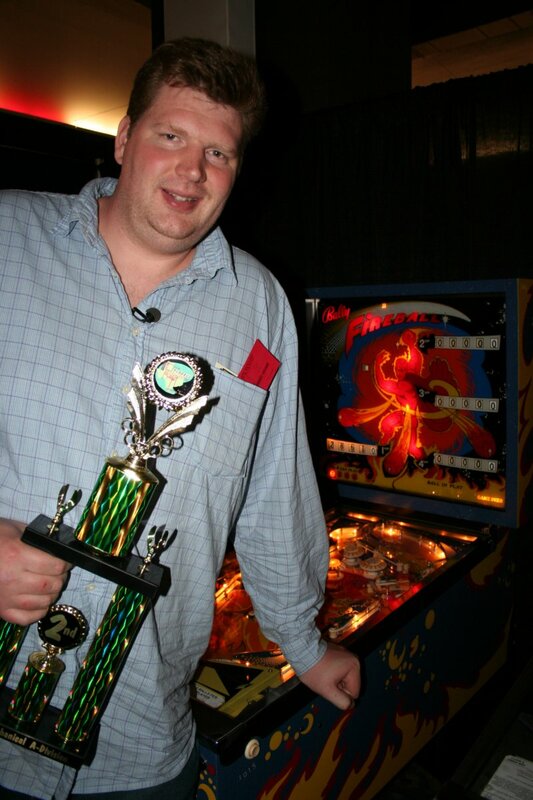 Here is Todd MacCullough getting his first pinball trophy (and definitely not his last considering how well he played ;-) in the Electro-Mechanical “A” Division. 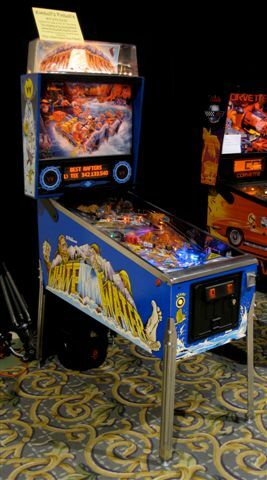 Thanks to Ken Kemp of www.pinballrebel.com for hosting many of the pictures in this report.